The Tissues, Cells Skin & Hair. Diabetes, Digestive disorders Arthritis, Asthma, Heart Disease, High Cholesterol, High Blood Pressure, Cancer Chronic Pain, Depression Kidney Problems, Tuberculosis, Menstrual Disorders, weight loss, stroke, Stress and Sleeping disorders. Morinda Citrifolia is assumed to have originated in Southeast Asia and was distributed throughout the Pacific islands by natural and man-made means. It is believed that approximately 2000 years ago, ancient peoples of French Polynesia brought the Noni plant with them as a source of food and medicine when they colonized the islands of the South Pacific. Written documentation about the use of Noni as food dates back to the late 1700s when Captain James Cook observed that the fruit was consumed in Tahiti. Subsequent publications indicate that Noni fruit was commonly eaten in Fiji, Roratonga, Samoa, Australia, and India. In addition, the roots and bark of the Noni plant were scraped and pounded to form a yellow or red dye used to color tapa cloths and clothing. Traditional uses of the Noni plant are varied and virtually every part of the plant is used as some form of medicine. Healers used Noni leaves as a bandage or poultice for wounds. Young, green fruits were crushed and the extracted was used as a remedy for lesions or sores in the mouth. Root or stem bark was typically used to treat inflammation or infections. Other conditions treated with Noni include fevers, skin disease, respiratory problems, gastrointestinal upset, menstrual or urinary problems, diabetes, and venereal diseases. Research into the traditional uses of Noni indicate that it was the second most popular plant used in herbal remedies with approximately 40 known and recorded formulations. Noni is included in the traditional pharmacopoeias of Native Hawaiians, other Pacific Islanders, and Asian populations. ADD/ADHD, addictions, allergies, arthritis, asthma, brain problems, burns, cancer, cardiovascular disease, chemical sensitivity, chronic fatigue, diabetes, digestive problems, endometriosis, fibromyalgia, gout, hypertension, immune deficiency, infection, inflammation, jet lag, multiple sclerosis, muscle and joint pain, polio, rheumatism, severed fingers, sinus, veterinary medicine. What is in the Noni Fruit? Proxeronine & Proxeroninase The building blocks our bodies use to manufacture Xeronine. With nutrient-depleted foods, where these building blocks are not available, our proteins can become reliant on inadequate substitutes such as sugar, caffeine, cocaine, or nicotine to do their work. In returning Xeronine to the body, Noni has been found to help break addictions to these substances. By promoting optimal protein functioning, Noni promotes massive cellular regeneration and hormonal balance. Scopoletin Has anti-inflammatory, anti-histamine, anti-bacterial and anti-fungal properties, lowers blood pressure, and binds to serotonin to help regulate sleep, hunger and temperature. Anthraquinone Controls infectious bacteria such as Staphylococcus Aureus, E. Coli & Salmonella. Damnacanthal Inhibits growth of pre-cancerous cells. Terpene Helps with cell rejuvenation, thus increasing nutrient-toxin exchange. Phytonutrients & Selenium Provide powerful anti-oxidant protection against free radicals. Rich in soluble and insoluble fiber Soluble fiber helps cleanse the blood, decrease choloesterol, binds to fats and balances blood sugar levels. Insoluble fiber ("bulk") is important for colon health. Rich in amino acids Amino acids are the buildings blocks for proteins, important for most body functions. The "essential" amino acids are the ones our bodies cannot make and we therefore must get from our diet. Noni contains 17 of the 20 known amino acids, including all 9 essential amino acids. Rich in essential fatty acids Fatty acids are the building blocks of fats and oils. 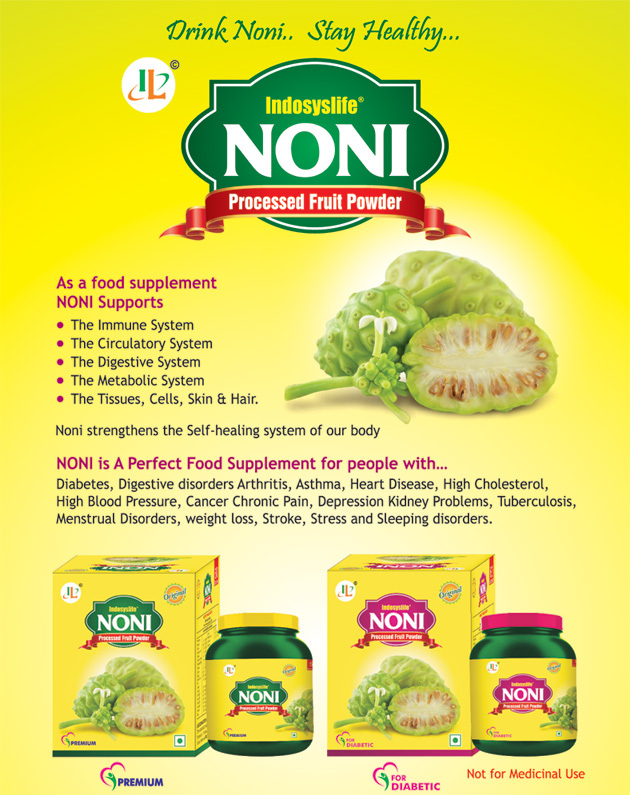 The "essential" fatty acids in Noni are the important poly-unsaturated fats that we must get from our diet. They maintain healthy skin, nerve cells, heart tissue and blood vessels and help balance mood. They keep cell membranes working properly and efficiently, improving the nutrient-toxin exchange. Adaptogen An adaptogen is a substance that has a global balancing effect on all body systems. There are only 12 known adaptogens; of these 12, Noni is said to be the "premiere" adaptogen. Alkaline Tissues degrade and disease thrives in an acidic environment. Noni promotes an alkaline body chemistry, the optimal state for good health. Anti-oxidant Anti-oxidants, such as green tea, pycnogenol, and vitamin C, among others, are important in neutralizing "free radicals", or particles that cause DNA damage that can lead to cancer. Noni has recently been found to be the most effective of all known anti-oxidants. 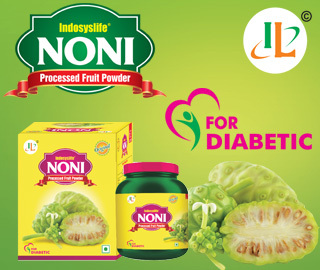 Low Glycemic Index A 3:1 ratio of carbohydates to fiber in Noni helps balance blood sugar levels. Analgesic, Anti-inflammatory and Selective Cox II Inhibitor Unlike typical pain relievers and anti-inflammatories, Noni decreases pain and inflammation while protecting stomach, kidney, and liver cells. Humectant As a humectant, Noni helps tissues retain moisture. Immuno-Modulator Noni intelligently supports the immune system, not just by boosting it, but by regulating it to suppress the allergic and auto-allergic responses. Ancient healing manuscripts handed down from generation to generation, cite the Noni fruit as the primary ingredient in their natural health preparations. Traditional healers would pick the fruit before it was fully ripe and place it in direct sunlight. When fully ripe, the fruit was mashed into a puree and the extracted through a cloth. As a general tonic was taken during times of rest. In addition to the fruit, every other part of the Noni plant was valued and used. Below is a representative list of the traditional uses of Noni.